on the outside of Hollywood looking in. the story of the duo as they mount what they hope is a comeback with a vaudeville tour of Great Britain. Interspliced among the trip are scenes from the duo's past. We join them on the set of 1937's "Way out West." nickname), Hardy replies, "You loved "Laurel and Hardy," but you never loved me. of the film writing scenes for  a comeback film he knows will never be made. Thankfully this one was. or YouTube. 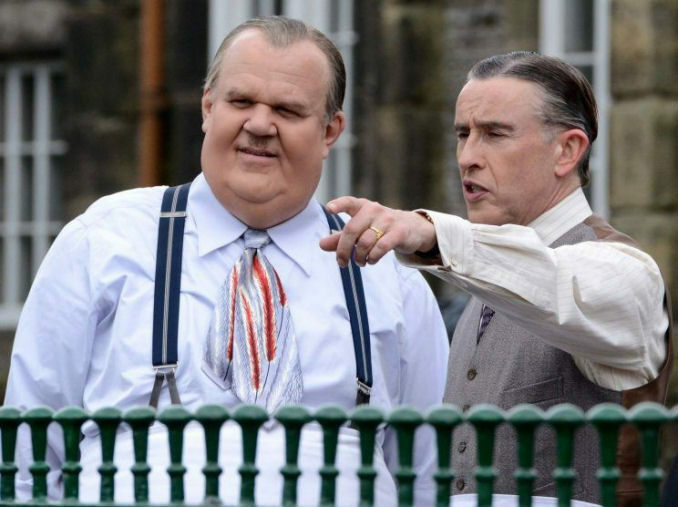 If you are, and are a fan, I urge you to seek out "Stan & Ollie." Laurel & Hardy are comedic legends…always will be. “March of the Wooden Soldiers” is based on Victor Herbert’s 1903 operetta “Babes in Toyland”. This 1934 film has been spectacularly restored and presented in color…but there is still more this new release from Legends Films has been enhanced with a stunning stereoscopic 3D transfer. The film is still a little bit creepy (as it has always been), but still fun to watch around the holidays. This is the first time that you have ever seen this film like this and let me tell you it looks good! Official Premise: Imagine an enchanted fantasy world of timeless characters and magical moments where nothing goes right for the clumsy toymakers Stannie Dum and Ollie Dee. When a notorious scoundrel, Barnaby, demands to marry the beautiful Little Bo Peep, guess who secretly emerges as the blushing bride? Based on the original Babes in Toyland, this movie is a dazzling spectacle of 6-foot wooden soldiers, Mother Goose characters and the beloved team of Laurel and Hardy. The original black and white tape was completely restored using the Legend Films proprietary restoration technology and then was colorized in High Definition resolution. So on this release we have the fully restored color and black and white versions. There are no special features included on this release though unfortunately. I would have loved to see some classic shorts or other vintage goodies. Nonetheless, Legend Films has scored again with another great restored and in this case 3D conversion. Can’t see what they have planned next. Having two tattoos myself, I am not against getting inked. In fact, I feel that some tattoos are real works of art. Ed Hardy is known best for his amazing tattoo imagery, especially Japanese inspired artwork. I enjoyed the background on how Ed got started and how he got inspired to create the work he has. The film runs slow, even for a short 75 minutes. The angle that this documentary takes focuses on Ed Hardy and details his unexpected rise to cult status. The film also shows how he has effected modern tattooing and his phenomenal influence on pop culture. Besides interviews with Hardy himself, there are also interviews from other industry well-knowns and tattoo aficionados. The extras are decent with deleted scenes, which some are decent to check more. Also there was additional interviews and more tattoos and artwork included. They are worth being checked out but only if you enjoyed the first 75 minutes from this disc. An interesting feature is 2000 Dragon Scroll focuses on Hardy’s scroll painting of 2,000 dragons to commemorate this Millennial Dragon Year. “Laurel & Hardy: The Essential Collection” Announced Today! Transferred in high definition for the first time and digitally enhanced for home viewing in the finest quality available to date, the set contains favorites that have been enjoyed for generations including Helpmates, Hog Wild, Another Fine Mess, Sons of the Desert, Way Out West, and the Academy Award® winning* film The Music Box.